The college football season presses on with a number of interesting matchups on this Saturday’s slate. The following is a quick look at my top three picks for the day based on betting odds from BetOnline. Louisville has bounced back from a 0-3 straight-up start with back-to-back victories against Samford and North Carolina State, but I am still not sold on the idea that it can keep things all that close against Florida State following last week’s bye. There are still a number of question marks with an offense that is ranked 71st in the nation in passing yards and 78th running the ball. The Seminoles have been a tough bet with a 2-3 record against the spread to go along with their perfect 5-0 SU start, but they continue to separate themselves as one of the top teams in the ACC this season. Florida State has a solid arm in quarterback Everett Golson and Dalvin Cook ran for 222 yards on 22 carries in this past Saturday’s 29-24 victory against Miami as a 6.5-point home favorite. Look for the Seminoles keep things rolling by covering this time around against Louisville. Virginia Tech was able to snap a two-game skid with a 28-13 win against North Carolina State last Friday to even its record on the year to 3-3 both SU and ATS. Despite the convincing win, I am not convinced this Hokies’ offense will be able to hang with Miami in this matchup. It is averaging just 378.5 yards a game with 206.5 yards passing and another 172 yards a game on the ground. The Hurricanes’ loss to Florida State was their second in a row after getting beat by Cincinnati 34-23 on Oct. 1 as 7.5-point road favorites. However, they now return home for this ACC tilt with a SU 15-3 record at home over their last 18 games. 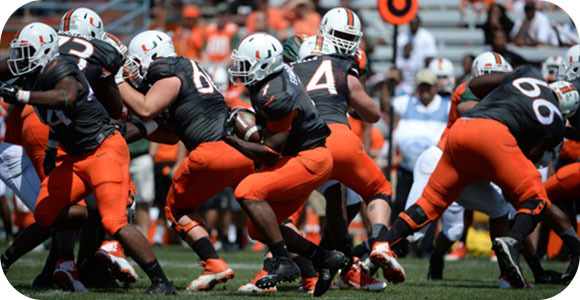 Miami is ranked 18th in the nation in passing yards behind quarterback Brad Kaaya. He has already thrown for 1,499 yards and eight touchdowns and I see him primed for another big day in a win against the Hokies that covers the seven points. Florida continues to rise in the national rankings behind a SU 6-0 start and it has been good to bettors with a 5-1 record ATS. My concern in this matchup is the simple fact that the Gators have yet to be really tested by a true quality team. The lack of a potent running game poses an even greater concern in this particular matchup as I do not see Florida quarterback Will Grier beating LSU through the air. LSU may have caught a break with a shift in venues against South Carolina in last Saturday’s 45-24 win as a 20.5-point home favorite, but the Tigers have pretty much taken care of business no matter where they play this year. Led by Heisman front-runner Leonard Fournette with 1,022 rushing yards on 119 carries, they are currently ranked third in the nation in rushing yards per game with 346.4. Look another heavy dose of Fournette this Saturday as the Tigers win and cover the 6.5 points.